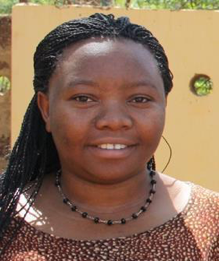 Editruda joined Amani as a care giver and the new Singida children coordinator in January 2016. In Singida she is the one making sure the children are getting the best care. Editruda developed a strong commitment to help vulnerable children after working as a child protection officer in refugee camps for two years. Editruda feels that the best part of working at Amani is all the new things she is learning from the staff and from the children. She was especially surprised to learn how street children live. Becuse they travel from city to city, jumping on moving trucks without the driver’s awareness or hitchhiking and risking their lives. She faced her biggest challenge at the beginning of the the initial six months. When everything was ready for the new center to start operating, and the Singida street outreach had started, the local government required an additional permit. It was really challenging for the team, because the delay made the children doubt Amani’s intentions. Trust is really important when working with street children. Fortunately the first eight children were allowed to come to the center in May: these challenges are now all part of the past. This is the one message Editruda wants to share with the world: “I wish everybody knew that street children have a reason to be on the streets. Previous Why an Amani satellite branch?